Notes: Double-D, capo at 2nd fret, 5th=a, aDADE. The tune is called also Old Ragged Coat, and some consider it a version of Boating Up Sandy. Bobby Taylor plays the tune with slightly different notes, calling it Ragged Shirt. Notes: Here's my arrangement of a popular old fiddle tune played out of C & F positions in standard G tuning, with the capo on the 2nd fret. I've added a 3rd part that many fiddlers play. Enjoy! Notes: Some fiddlers that I played with almost always included the third part of Ragtime Annie which moves down to G....hope you like it . Notes: This is from the Muppet Show where my friend Kermit is singing the tune. Rainbow Connection is a tricky tune because it has a key change in the middle, where the orginal key is raised a halt tone. Here the tune starts in C major but in the second half there is a raise to Db major or C#major. I think the original goes in A major and raises to Bb major. Notes: The Buddy Holly classic, arranged for simple rolling 3 finger style. Notes: This is a mandolin tune written by Bill Napier when he was with the Stanley Brothers, who recorded it first as Daybreak in Dixie and later as Ralph's Banjo Special. To make matters even murkier, they recorded it once again as Daybreak in Dixie but with a slightly different chord progression in the A part. Whatever, it is a nice tune that works well in jams. I have tabbed it in G, but you should capo up 2 to A (because it was written on the mandolin). Notes: This wild & crazy arrangement is from the playing of Steve Martin, and can be found on Steve's old stand-up comedy album Let's Get Small. 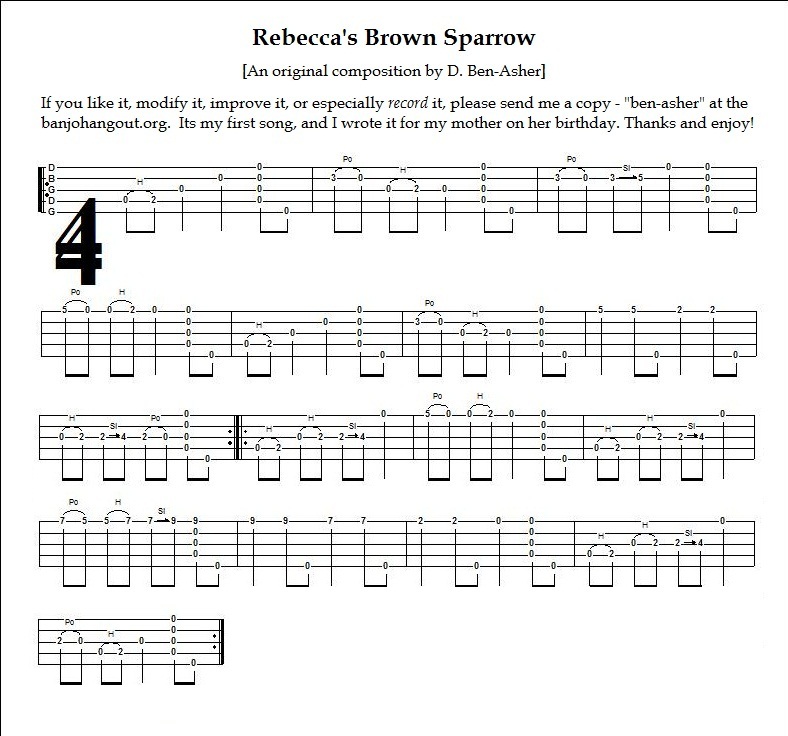 Notes: I have been teaching myself to play banjo for several months now, and wrote this song as a present for my mother, Rebecca, for her birthday. It is a short and simple tune, not difficult to play. Please feel free to modify it, or improve upon it as you wish; I only ask that if you make any changes or modifications to the tune, that you send me a recording of it...Thanks and enjoy! Notes: This song can be found on many banjo compilation albums released during the 1960s and ‘70s. 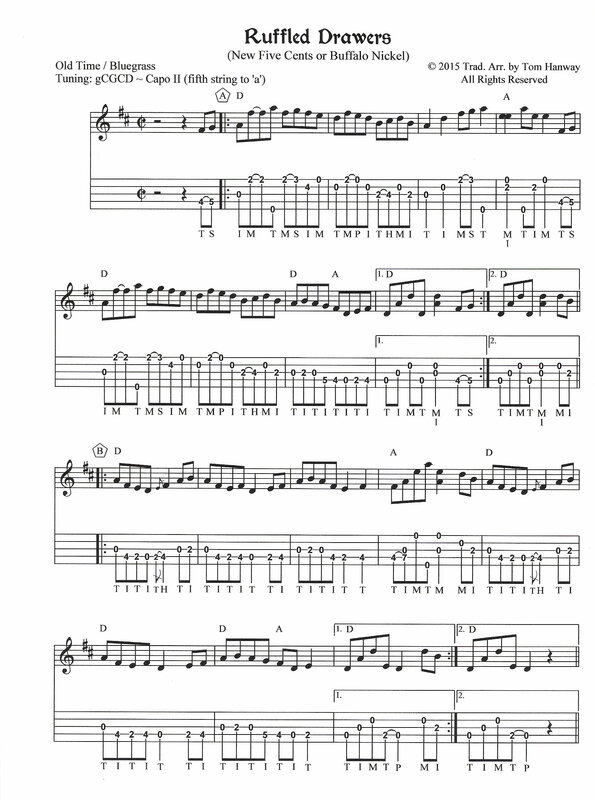 The arrangement features a mixture of three-finger picking and clawhammer (see tab notes). G tuning, capo at the 5th fret. Notes: Yeah, another version of RHB. This is a great old fiddle tune, played at almost all jams. I have tabbed out two breaks. The first is my attempt to capture the melody in standard "Scruggs" style (i.e., North Carolina three-finger style), with a few melodic riffs thrown in. The second is a more frankly melodic break. Lots of stuff here you can use in other tunes as well. Notes: Capo at the second fret. Notes: A fiddle tune I wrote in open-D AKA Reuben tuning. Notes: Here are two clawhammer versions of Gary Harrison's Red Prairie Dawn. The first is an easy beginners version and the second is a little more trickier. Notes: Garry Harrison, Illinois fiddler, composed several tunes, including Red Prairie Dawn, my favorite of his. He also collected the traditional music published recently as Dear Old Illinois -- a very extensive collection worth studying. Notes: I took the key and basic arrangement from the Red Clay Ramblers version, off their record called "A Lie Of The Mind". I arranged it similar to Scruggs Nashville Blues. D minor tuning capoed up 2: bEGBE. Notes: For our TOTW. Arranged by Jim Pankey, modified by Jack Baker. Notes: This is an arrangement in the key of A without using a capo. Notes: Redwing is a nice simple tune that is common in jams. However, for some reason it was never immediately obvious to me how to find the melody of the B part of Redwing. You could say that I had trouble winging it. Anyway, eventually I sat down and worked the B part up quite deliberately. The first break is pretty straight Scruggs style, whereas the second break is more improvisational. Notes: This is a wonderful version of Redwing as played by John Apfelthaler. Check out the videos on John's BHO home page to hear him playing it. First time around is Scruggs style, followed by melodic and up the neck arrangements. The down the neck arrangemnt is reasonably straightforward while the melodic and up the neck arrangements are reasonably challenging. Notes: This is my first attempt at working out a song and writing the tab. I think it's for beginner, but it might be beginner/intermediate. There is one drop thumb and a few hammer ons and pull offs. 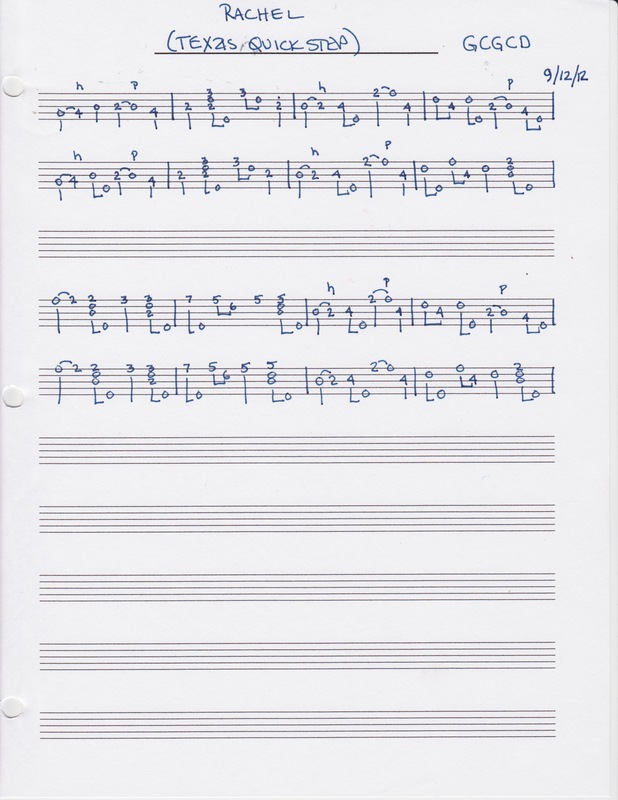 Notes: This is my transcription of a tune composed and performed by BHO member Jim Reed, in a video he posted on 1/26/12. I was just discussing the tune with BHO member John Steele in the BHO Chatroom (6/15/15), and we disagreed about how Jim plays the opening measure of the B part. I went back and listened to it again, and decided John was right. So I have revised the tab accordingly. Notes: A French-Canadian crooked reel, learned from Guy Bouchard. Notes: French Canadian fiddle tune. Played in key of D with aDGBD tuning. PDF files are for page 1 and 2. Notes: Another French Canadian Fiddle tune. Played in the key of D without capo in regular G tuning. Notes: This song has morphed into many different versions throughout the years. John McEuen first composed it in the 1960s as 'Dismal Swamp'. It later got some new life breathed into it when he rearranged it in the late-1970s and recorded it as 'White Russia' on the self-titled album 'The Dirt Band'. Later still it resurfaced once more in what we know today as 'Return to Dismal Swamp'. In my tab I've incorporated all the known versions of this song into one arrangement. It's a great banjo tune from the mind of John McEuen and it's worthy of your interest. Notes: Arranged by Andrew Alexis; first part is traditional, the second part I wrote. Notes: For my banjo students, here are some variations on Reuben in open D tuning. Some of it is very straight Scruggs style, and some is something else. Notes: This is from the Gilbert & Sullivan operetta "Ruddigore". Notes: Fairly straight version, kept that way so as when the fiddlers get hold of it, I can maybe keep up. Key modulates between D and A. Notes: This is for Bill Keith, my hero, friend and mentor. Here is a legato arrangement in Celtic Fingerstyle (G tuning, no capo), not unlike Bill Keith's bluegrass version but adding rhythmic and melismatic ornamentation in the form of triplets and double cuts (double-grace notes). Enjoy! Notes: Clawhammer version of the Grateful Dead's "RIPPLE"
Notes: This is a wonderful tune by Bill Monroe. My band has been known to have fun with the title -- "Road to Columbia," "Pathway to Peru," and so on. Anyway, the banjo break combines Scruggs style with melodic sequences, which are necessary if you have any hope of capturing the melody. In addition, melodic sequences are worth playing for their own sake, and I regret that they seem to have fallen out of favor with many current banjo players. I have included two versions of the B part, a low break and a high break. I play it either way, although the version low on the neck is easier when the stage is dark (and I can't see where the positions are higher up on the neck). To accommodate the fiddle, the tune is played in A, with the banjo capoed up 2. Notes: My own version of the Bill Monroe/Kenny Baker tune off of the album Kenny Baker plays Bill Monroe. Hope you enjoy! Soon I'll also work out a tab that mimics the mandolin, and then hopefully can work out the actual banjo line from the album. Notes: I wrote this tune in late 2009 and named it after one of my favorite paintings by my favorite artist, who I happen to be married to. (For a glimpse of her art, go to www.jancorcoran.com). The tune wrote itself as I fiddled -- okay, "banjoed" -- with the chord progression, and I managed to incorporate the use of Keith tuners. I hope you like it. Notes: A request from Reddit. 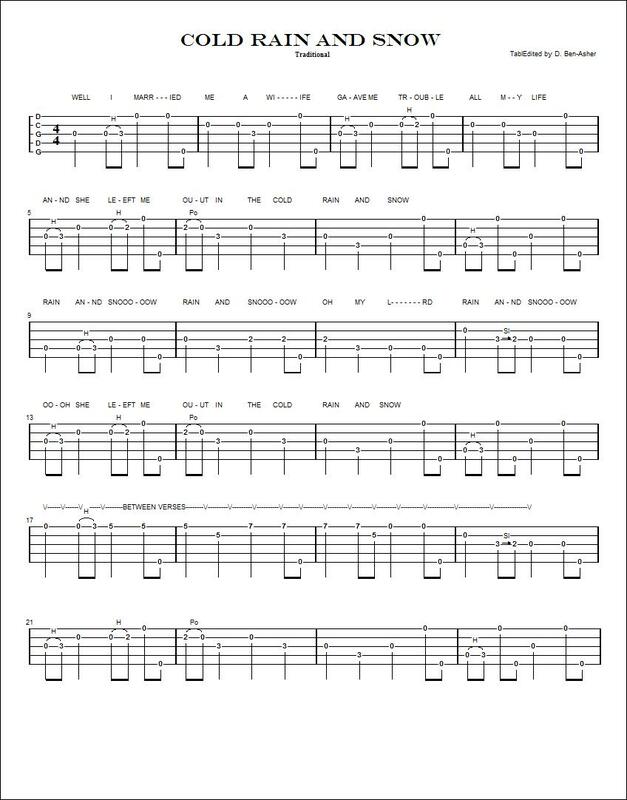 The main banjo line/riff for the song Beggars Guild by the band Roadkill Ghost Choir. Notes: From the fiddling of Owen "Snake" Chapman, arranged by Mark Johnson. Notes: A study in thirds and sixths that uses no open notes so as to make it easy to play in any key by moving the melody up or down the neck. Notes: Arranged by Wayne Conrad. Notes: I have tried get this as close to Don's recording as I can. It will play as a loop for practice. Notes: This is an old timey song and sounds somewhat celtic when played at speed. Notes: This is a clawhammer version of John Denver's Rocky Mountain High. Notes: This version of Rocky Road to Dublin comes from Fiddler Wilson Douglas of Clay County West Virginia. Wilson was born in 1922 on a farm in rural Clay County in an area known as Rush Fork. Sometime in the early 1980’s, Kate Brett and I decided to visit some older players in West Virginia. We were looking for Wilson, and happened to stumble upon David Morris, who arranged a meeting. I did not know Wilson well, but he had a fierce feeling and a deep passion for old-time music that was moving and inspiring. Wilson Died at age 76 in 1999. Wilson recorded “Rocky Road to Dublin” on “The Right Hand Fork of Rush’s Creek”, Rounder Records 0047, recorded and produced by Guthrie T. Meade and Mark Wilson, 1975 , re-released on CD in 2005. Wilson plays this tune in the key of G on the recording. When I worked it out on the fiddle, it seemed to fit best with the fiddle tuned “GDgd”. The album notes say this: ‘The title has been used for at least one jig and a polka, presumably referring to the Irish city. Wilson says, “that tune was composed about Dublin, Virginia. That was the only trail at that time through Virginia and they named the town Dublin”’. Wilson’s recording actually starts on what I would call a fragment of the “B” part, and then goes to the “C” part, before going to the “A” part. (The tune ends on the “C” part). I have recorded the tune with the “A” part first, the “B” part second, and the “C” part third. The “A” and “C” parts repeat, but the “B” part is only played once. Towards the end of the recording, Wilson plays a variation on the “A” part. The first time I play through the tune, I play it straight, but the second time through, I play the “A” variation. For variety, I created some up-the-neck variations for the third time through before returning to the theme the last time around. 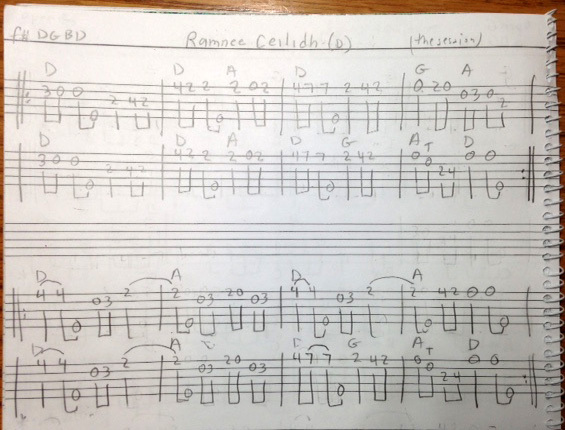 Note that an “R” in the tab indicates a roll (Galax Lick), and “()” in the tab means the note is to be played quietly or may be skipped entirely, at the discretion of the banjoist. Allen Sisson recorded an entirely different melody titled “Rocky Road to Dublin”. Another version comes from Clyde Davenport. Notes: This nice tune was played by fiddler Bob Walters and included in R.P. 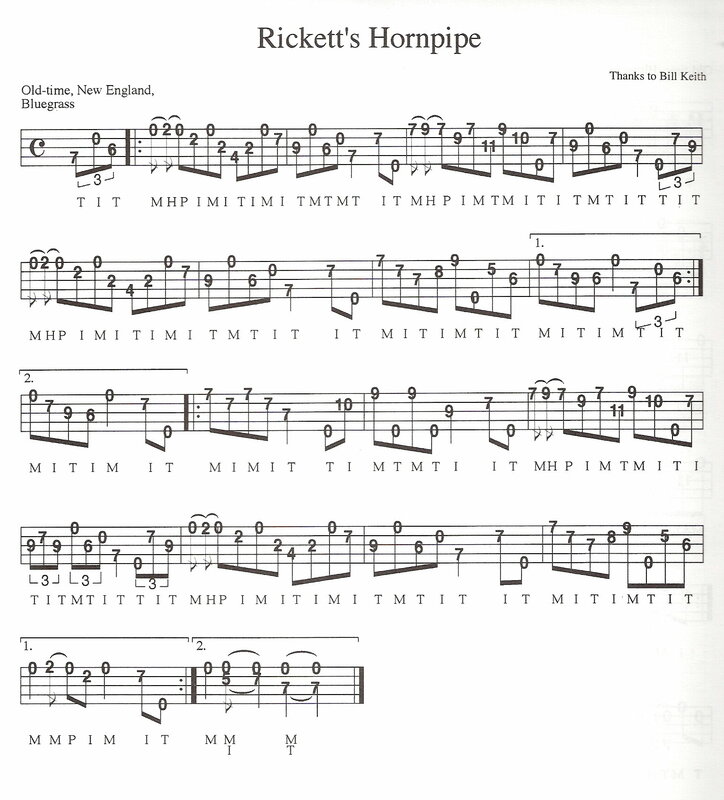 Christeson's Old-Time Fiddlers' Repertory book as unnamed tune #107. Notes: Not everyone can sing Rocky Top in G, A, B flat, or B. One guy I have picked with (Vic the Butcher, who is the biggest ... but I digress) can sing it only in D. Well, it works well in D, in G tuning with the fifth string tuned up to A (slip it under the model railroad spike at the seventh fret). The only tricky bits in my arrangement are in the chorus. If you have difficulty figuring out how it should sound, give a listen to the TablEdit MIDI file. Notes: This is an "etude" as much for me as anyone else - I'm studying "Bach language" and "banjo language," and playing around with modulation - all part of getting me where I want to go compositionally. I like it at quarter = 175, with the middle section a little slower. In any case I think a metronomic approach to this might not conform to "the composer's intent." I'll learn to play it and letcha know! :o) The chicago-capoed-at-the-fifth-fret tuning is because I originally wrote this on my ukulele. Copyright now, me. Notes: This was copied from a pdf of a Jack Hatfield version "Roll in My Sweet Baby's Arms" is an American traditional song. It seems to have developed from lyrics in the cowboy song "My Lula Gal", itself a development of bawdy British and Appalachian songs generally known as "Bang Bang Rosie" or "Bang Away Lulu. Notes: An example of rolling backup for Roll In My Sweet Baby's Arms that I made up with examples of interchangeable G, C and D licks. Notes: This is a bluegrass classic, similar to Nine Pound Hammer. The first break is my interpretation of Joe Drumright's break on Bill Monroe's 1964 recording. The second break is my own. Monroe plays the song in the key of B. 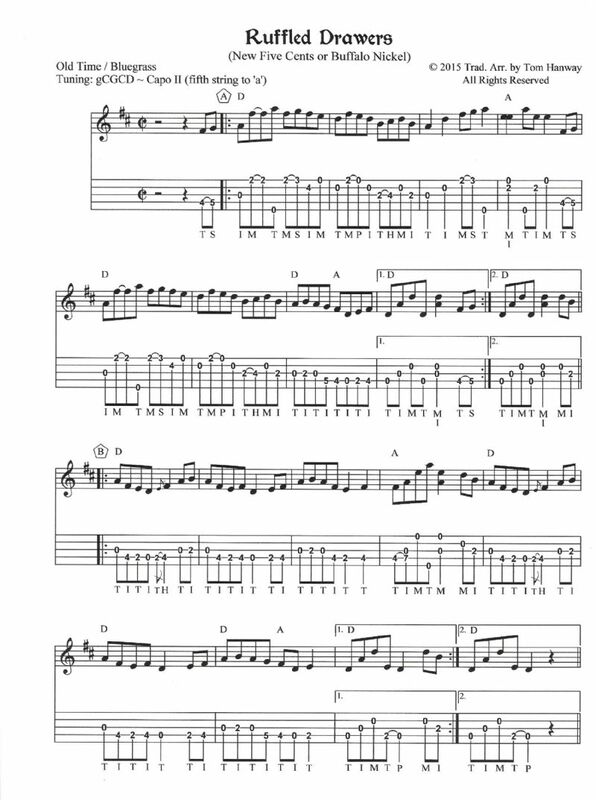 Notes: A John Morgan Salyer old time fiddle tune arranged for clawhammer banjo. 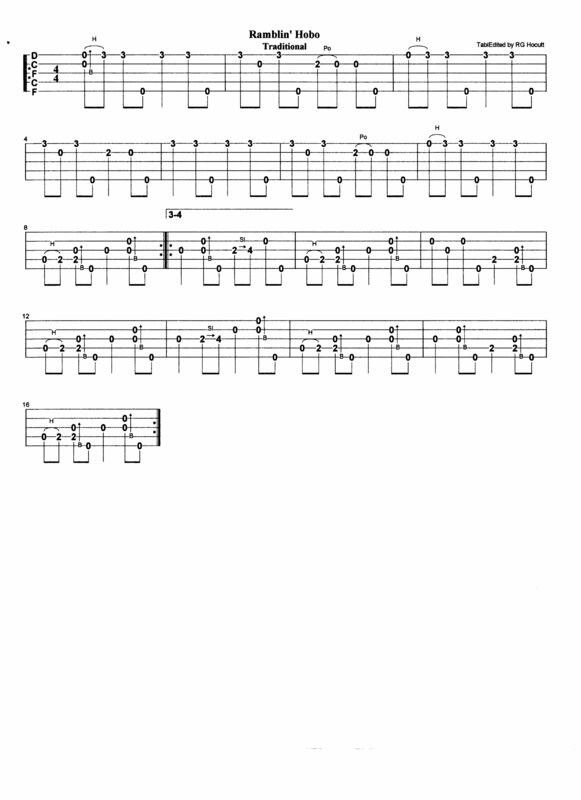 Notes: Inspired from the movie "Outlaw Josie Wales", this tab delves heavily into drop-thumb. The drop-thumb measures are shown as alternate measures at bottom right. I've included the lyrics as song by Bobby Horton and a youtube link at bottom. Substitute the drop-thumb measures to add melody to the tune as you get comfortable with the song. Notes: Collected from Fletcher Fulk of Clay County, IL. Appear in "Dear Old Illinois." Notes: The first tune that I composed which uses D-tuners, with special thanks to Bill Breen (Just Bill) who helped me with the arrangement. Notes: Royal Rag, by Thomas Armstrong c.1926. A and B parts are in F, C part is in Bb. Notes: 2 finger style, Melodic. Part A = bars 1 - 8. B = 9 - 16. The song is normally sung either AB, AB, or B, AB, AB, B. Notes: 2-finger style. With a third finger brought in for the pinched chords. Notes: Dock Boggs' "Ruben's Train", from his Folkways recordings in the 60's. This is a very simple, easy piece, with some very weird notes in it. You almost have to listen to the recording before playing it. Tuning is "Graveyard" open-D, f#DF#AD. Notes: The reindeer with the red nose. Check out my video files for a clip of this one. Notes: Here is a straightforward setting using Double D tuning (Double C-Capo II) for the Old Time reel that goes under interchangeable titles. The titles create confusion since there are two main branches in Old Time and further regional, local and bluegrass variants. The A Part is pretty close in most versions with one noticeable variation – either dipping down to an A-note or rising up to F# in the second and sixth measures. This variation is found in both Old Time and Bluegrass versions and a G chord is sometimes played in these spots. It’s in the B Part (fifth and sixth measures) where the melodic contour branches in one of two directions – either dipping down from the fifth (A) to the tonic (D)/D chord, or, as Paul Warren played it (New Five Cents), using a G-note double-stop with a B-note)/G chord, then up to an A-note/A chord and moving upwards happily in major second intervals. Many (but not all) Old Time versions (‘New Five Cents’, ‘Ruffled Drawers’ or ‘Buffalo Nickel’) tend to keep dipping down to the low D-note/D chord and use fewer chords than Bluegrass versions which are based on Paul Warren’s version. Notes: Two version of J.E. Mainer and his Mountaineers Run Mountain". The first is thumb lead. The second is index lead but can also be played clawhammer. Notes: Here is an updated version of the tab I posted in 2006. Notes: Rustic Dance, by CR Howell...probably 1890's (no copyright on my edition). Very popular piano piece, almost the definition of the cartoon "happy dance" of the 30's. Notes: Just the TablEdit file for Rustic Dance. See the .pdf version for notes. Notes: Taken roughly from the playing or Art Stamper. TOTW 10/11/13. Enjoy! Notes: Tuining - aDADE. This version could be played for a dance as it's regular.